Quantum theory as originally formulated could only be applied given a classically-described experimental context. As such, can it be applied to the description of the universe as a whole? 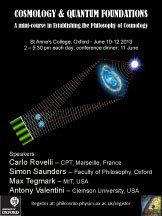 How should it be formulated so that it can yield a quantum theory of cosmology? Is such a description even needed? What problems in cosmology might be solved in this way? This minicourse examines these questions from the perspective of many-worlds theory, pilot-wave theory, and the relational interpretation of quantum theory, with lectures from leading advocates of each.